The next stop on our winter RV journey was Saint Augustine, Florida. We had a beautiful campsite in Anastasia State Park to call home for a few days. The weather was lousy most of the time but we picked a perfect sunny day to do some sightseeing. At the top of my to do list was visit the Saint Augustine Alligator Farm Wading Bird Rookery. 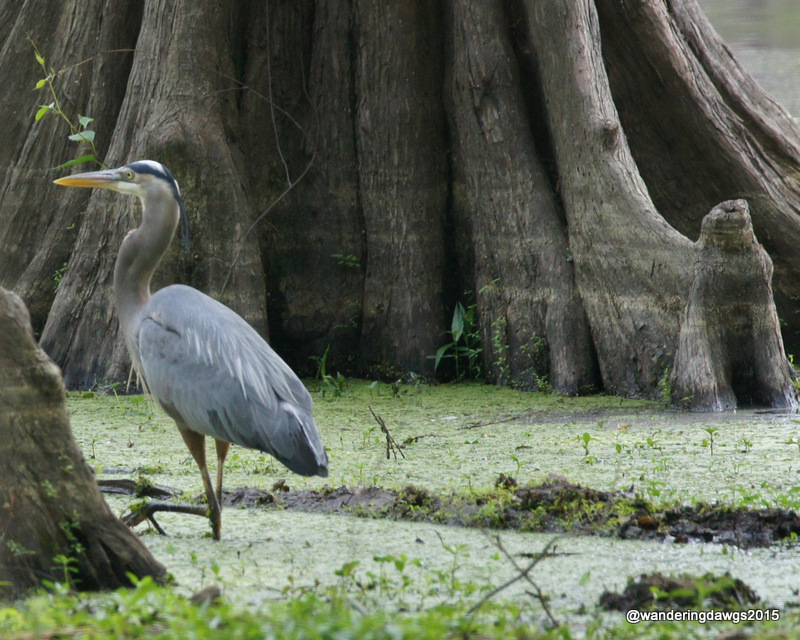 During nesting season wading birds come to nest in the trees in the Native Swamp at the Alligator Farm. The birds who nest here are wild and can come and go as they please. Although it was a little early in the nesting season there were a lot of great egrets and roseate spoonbills wearing their breeding plumage and some pairs were starting to build their nests. 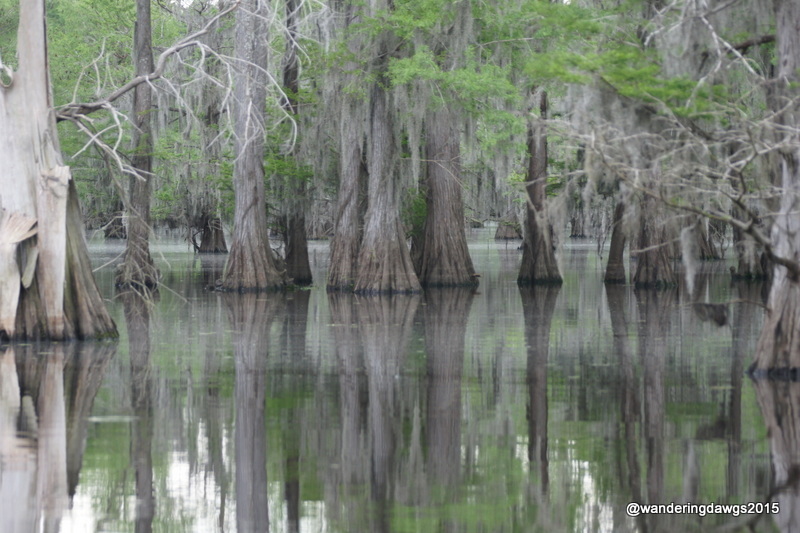 The trees surround a swamp area filled with alligators. A boardwalk winds around the swamp giving visitors close up views of the alligators in the water and the birds in the trees. The Great Egrets showed off their breeding plumage and pairs worked on their nests. The Roseate Spoonbills were my favorite. Coming up next, more about our St. Augustine adventure including other critters at the Alligator Farm. When the tide is just right and the minnows in the water are plentiful, wading birds gather in the salt marsh in search of food. 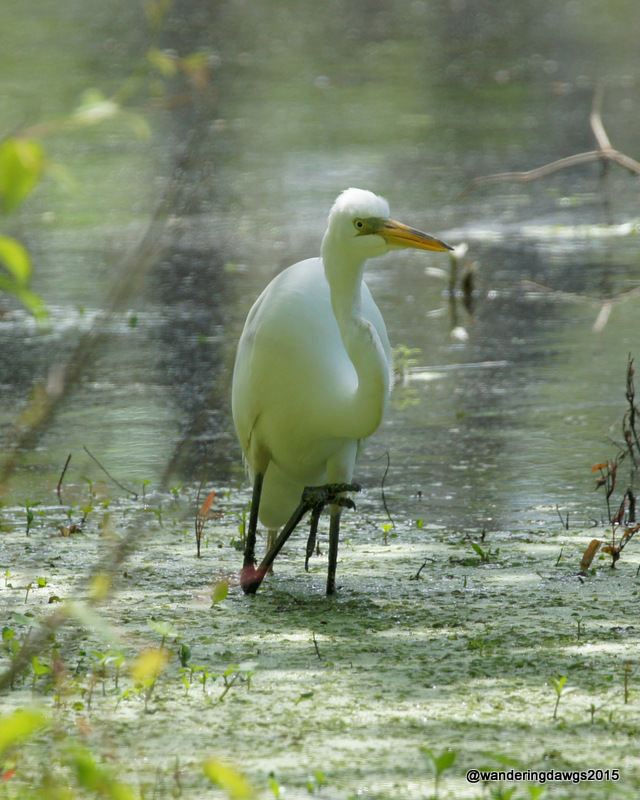 White Ibis, Egrets, Herons, and Wood Storks can often be seen feeding side by side in the marsh. This morning my husband got my attention to show me a long line of white birds lined up on the railing of our neighbor’s dock. By the time I got my camera ready many of the birds had flown down into the marsh but there were still a few white ibis and great egrets surveying the area before diving in to eat. It’s always entertaining to watch the white ibis as they feed. Usually there is a large group of them poking their long beaks under the water to capture fish. 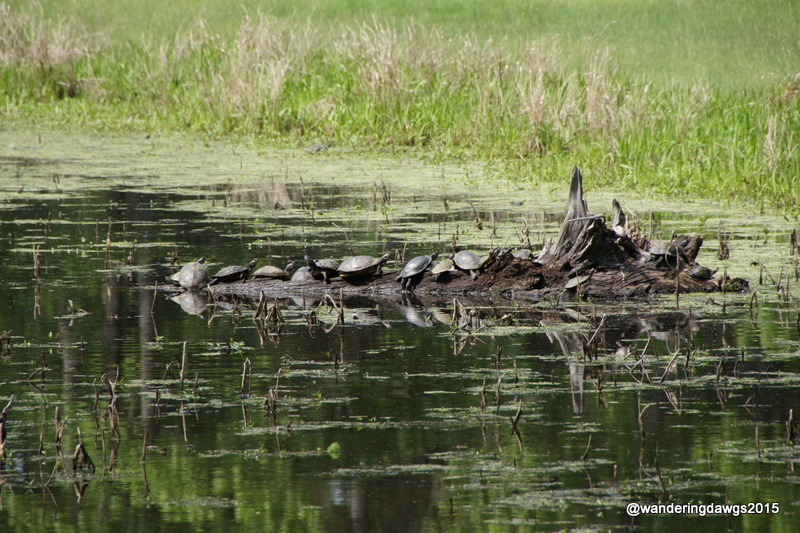 Suddenly, all of them will start wading through the water in the same direction in search of more food. They don’t stay long in any one place. Eventually, they tire of the area and fly off in search of better fishing grounds. I never know when I’m going to stumble across flocks of birds in the marsh but it’s always a treat when I see them. I was lucky to see them this morning and was glad to have my camera nearby. After almost six weeks exploring the great state of Texas it was time to head east toward home. We were sad to leave Texas but happy knowing we would soon be home. Our first stop in Louisiana was a place where we had camped on another trip four years ago. I had such fond memories of our first visit there I’ve been looking for an excuse to go back. I even made reservations for site 12, the same one we had camped in before. With a deck and a fishing dock right in front of the site, it was a perfect place to chill for a couple of days. Lake Bistineau State Park is located about 20 miles from Bossier City. I remembered how friendly one of the rangers at the park was when we first visited and I was happy to see the same ranger greeted us at the office and checked us in. I have to say he is one of the nicest, friendliest, and most helpful park staff member we have ever met. We had a beautiful view of the lake from our deck and spent a lot of time just chillin’ and watching the herons and egrets fishing in the shallow water along the banks of the lake. I was way behind on doing laundry and was happy to find a small laundry right there in the park. And it was free! There was also WiFi at the park office and I could do a little catching up on the blog while we were there. We did a little shopping in Bossier City and got our fix of more Cajun Food at Shane’s Restaurant. Crawfish Etouffee and some Boudin to go and we were happy! But it wasn’t all work, shopping and eating. We’re pretty good at sitting and chillin’. Did I mention we had the campground almost all to ourselves? There were only two other campers there the first night, and the next two nights there was only one other camper in the park. Perfect! But eventually we had to move on. When we made the decision to go home via I-20 we could not miss a stop in West Monroe, Louisiana to see the headquarters of Duck Commander. Duck Commander was established in 1972 by Phil Robertson. After an outstanding football career in college Phil had an opportunity to play professional football in the NFL. He turned down the offer because he didn’t love football. He loved hunting and fishing and wanted to make a living doing what he loved. He was unhappy with the duck calls that were available at the time and in 1972 started selling his own design. Lake Bistineau State Park is located near Doyline, Louisiana. The sites have paved water and electric hook ups, pads, picnic table, and fire pit. We had a premium site with a wooden deck overlooking the lake. There are several fishing docks located in the campground. The park also has a boat launch. To visit Duck Commander we stayed at Ouachita RV Park in Monroe, Louisiana. The full hookup park had gravel pull through sites with free WiFi that actually worked, a nice laundry room, a meeting room, and a small pond.